The Only One: A Talk With Shonda Rhimes On Friday night, Shonda Rhimes spoke about her hugely successful television career, her love of the National Spelling Bee, and the New York Times article that called her an "angry black woman." Shonda Rhimes speaks onstage at the How to Get Away with Murder panel during the Television Critics Association summer press tour. I saw Shonda Rhimes at a panel presentation at the Television Critics Association press tour this summer where she helped introduce How to Get Away with Murder, the new ABC drama she helps produce but did not create. I found her pleasantly (and a little amusingly) transparent in not loving some of the questions she was asked (including one about whether she was worried that #HTGAWM, which was printed on the promotional cookies ABC handed out, was an unwieldy hashtag), and I thought, "She is an interview for which you would want to be on your toes." So when the Smithsonian Associates asked me to spend an hour talking to her on stage in front of 550 people at the Natural History Museum, I thought, "Hey, what's the worst thing that can happen, other than me looking like never mind let's not think about it sure OK let's do it." And then on Friday morning, about 12 hours before we'd be settling into a couple of armchairs, a piece by Alessandra Stanley in The New York Times blew up online. The lede was this: "When Shonda Rhimes writes her autobiography, it should be called How to Get Away with Being an Angry Black Woman." I read that lead about four times, but the words were still there. The title was "Wrought in Their Creator's Image," and the photo was of Viola Davis, who plays the lead in How to Get Away with Murder, of which Shonda Rhimes is not the creator — a white man, Pete Nowalk, is. It went on to describe how, to Stanley's eye, Rhimes had appropriated, embraced and ultimately made "enviable" the idea of the stereotypical "angry black woman," which Stanley felt was a title that could be applied in varying degrees to every black woman Rhimes has ever written on any of her shows, essentially. And Viola Davis — playing, remember, a character Rhimes didn't write — was the zenith of this effort by Rhimes to create interesting, brave, unapologetic angry black women in her own image. At the same time, it managed what appeared to be backhanded slams at Davis' not being as "classically beautiful" as Kerry Washington, backhanded slams at characters like The Cosby Show's Clair Huxtable (not really true to Clair's often emphatically feminist spirit, but necessary to underscore the thesis that only Rhimes has broken television's black women out of limited roles), and a raft of — as Rhimes would later put it in conversation with me — coded language that would never be applied to men or white people in the same way. The sheer number of things that were problematic about the Times article was best captured by Margaret Lyons in Vulture, who titled her response "There Are Just So Many Things Wrong with the New York Times' Shonda Rhimes Article." Other reactions in Vox, Slate and Jezebel spread far and wide on Twitter all day long, thanks to tweets including ones from Rhimes herself and Scandal star Kerry Washington. It's not really necessary to repeat that work; it's been done well. Believe it or not, it took an hour or so for my brain to connect this controversy to the fact that I'd spent the past several days preparing for this conversation with her. Here she was, blowing up on Twitter, and we were about to sit down in a few hours and chat for an hour. I should say: It was my specific wish as I was preparing for all this not to ask her to spend all her time talking about the diversity of her casts, the lack of diversity in Hollywood, and the importance of diversity in general. The primary reason was more practical than principled, and was partly selfish: She may be the most powerful showrunner in all of television and I write about television, and we're going to sit down for an entire hour and I have heard her talk about this and I think there are better things to do than ask her to lament all the things that other people are not doing and re-demonstrate an interest in diverse casts and diverse television that she has already demonstrated by making her shows. In a situation like this, the audience is there to hear her speak, and she's there to speak to them, and in my chair, you try to stay quiet and out of the way despite being in large part responsible for which things get talked about. One of the great manifestations of privilege for white guys who run television shows is that they rarely have to talk about this stuff on an institutional level. For the most part, as long as their shows have at least one character of color, they may be asked about particular happenings or portrayals on their own shows, but the fact that they are part of a system that turns out show after show about white guys doesn't come up in every conversation. People who are making the same kind of television that's already being made are usually left alone to make it. 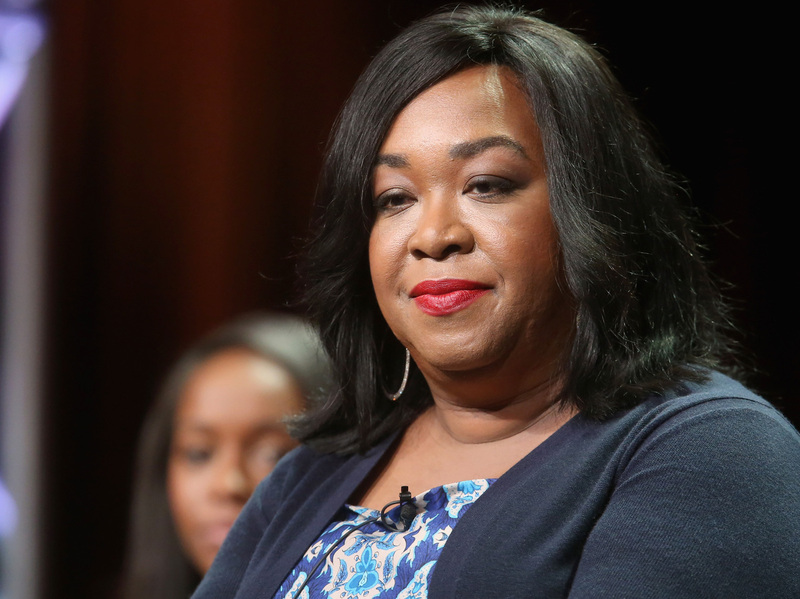 It's people like Shonda Rhimes who are asked, over and over again, to occupy time they could be spending talking about characters and shows, building their own narratives about their ambitions and careers, sitting on the stage at the Smithsonian, talking about diversity issues they've addressed in their work. They are the ones asked to agree yet again that it's not really OK that, as Maureen Ryan reported at the Huffington Post this spring, HBO at the moment effectively doesn't make shows with creators who are not white men. As Ryan pointed out, it's necessary but beside the point to press individual creators (like Nic Pizzolatto of True Detective) about their portrayals of women, for instance, when it prevents a broader conversation about television as a whole. Who often gets asked about television as a whole? About people of color on television? About black women on television? Who's expected to act as broadcast television's conscience and diversity czar? Shonda Rhimes. And every minute she's asked to spend serving that function, valuable and necessary as it is, and perfectly understandable as it is that people are curious about her experiences, is a minute she's not answering the same questions Damon Lindelof gets, or Joss Whedon gets, or Chuck Lorre gets. She's not talking about her process, she's not talking about her characters, she's not telling her silly show business stories. She's saying, yes, this is bad (as we know). Yes, this is a loss (as we know). Yes, networks who ignore entire audiences are leaving viewers on the table at a time when nobody can afford to do that (as we know). This is why I'm telling you all this. This is why I'm in this story: because this is where the struggle I was having dovetails with what's going on in Alessandra Stanley's piece. The question of how to interview her in a way that doesn't ignore interesting characteristics of her work and doesn't pretend we're in a post-racial landscape where none of this exists but also doesn't treat her as solely Shonda Rhimes The Black Female Showrunner is related to the question of how to receive female characters of color and acknowledge that their race is part of their identity without thinking of them as primarily in terms of what kind of Black Female Character they are or how they fit into the picture of diversity. When the rage blew up in her face, Stanley said in a statement that her intent had been to praise Rhimes, to talk about how she had managed to rise above stereotypes. It seems that Stanley thought she was saluting Shonda Rhimes for creating angry black women who weren't Angry Black Women, who could thus "get away with" being thus. She wasn't being critical. On stage, sitting across from me, Rhimes dryly mused that she is not a fixer (like Olivia Pope), or a lawyer (like Davis' character), or a doctor (like Miranda Bailey on Grey's Anatomy). So what, she wondered, could it possibly be? What could she possibly have in common with these characters that led to the automatic assumption that they were her avatars? Stanley likewise situated every black woman Rhimes has written — and one she hasn't — as a response to and subversion of stereotypes of angry black women, black nurses, black nannies and "sassy" (uch) women that were built largely by white male writers. In this analysis, the qualities of Olivia Pope are not interesting for their own sake, but noteworthy because they represent "embracing" and manipulating and subverting and undermining the ways white people have drawn black people. She has assumed that Rhimes is writing these characters not because, like Lindelof and Whedon and Lorre and others, she finds that making television is a pretty good life, but to beat the system. She's writing them not as a creative act, but as a reactive and political one. In this version of the world, Rhimes is — all her characters are, but she herself is, as a person — "getting away with being an angry black woman," as if the other option were to not get away with it. As if she writes from a defensive crouch, hyper-aware of how lucky she is. Again, this is Shonda Rhimes as this piece imagines her, not Shonda Rhimes as she's ever spoken in interviews or presented herself. So now here we were, with this story out there, about which Rhimes had tweeted a few times, enough to make it clear that she had thoughts. We chatted briefly backstage beforehand, and when we sat down in front of about 550 very excited people who will — if I did it right — never, ever remember I was even there, I said, "So this morning, I was reading my New York Times." And they laughed, with warmth, and with eagerness, because they wanted to hear her talk about this so much. I had next to me an unwieldy pile of audience questions on index cards, and several were variations on, "Can you please address that terrible New York Times article from today?" It was on our minds, collectively. She said, for instance, that she hates it when people say she writes "smart, strong women." The alternative, she said, would be writing what? "Dumb, weak women"? Nobody, she pointed out, praises people who write smart, strong men. When you make smart, strong women in and of themselves noteworthy, you reinforce that they are exceptions to something, and it almost doesn't matter what. And of course, we talked about the fact that How to Get Away with Murder isn't even a show she created (she later described Nowalk bringing it to her pretty much fully formed), a factual error that unravels much of Stanley's thesis to begin with. But this took about three minutes, tops, after which — despite the full hour we could have spent talking about the problematic coded language she mentioned, the remarks about the beauty of black women that were full of apparently unconsidered racial undertones, and the strange swipes at other characters and actresses — we talked about other stuff. I asked her about her well-documented love of the National Spelling Bee. I told her that I always start off intending to root for all the kids equally, to which she immediately replied that she is not like that, thank you very much; she's got all the competitors figured out and researched ahead of time and she knows who she's rooting for. She loves the kids who are just starting out, the kids who are on their last year of eligibility, and the kids who don't understand their own talents. I asked her about the different writers' rooms at Scandal and Grey's, given that Grey's has a more leisurely and organized pace, while Scandal is, to put it bluntly, rather bonkers. (She affirmed that the Grey's room is full of mostly normal people, and the Scandal room is ... not. They're sort of sick, she'll tell you herself, and she'll smile the whole time.) She talked about how Nowalk mentioned Viola Davis as a possibility for HTGAWM and she called the idea "cute," assuming Davis would never say yes, until she did. We talked about the list she asked Viola Davis to make of the things she needed to be happy, and how striking it was that Davis, despite her successes, found it such a difficult task. We talked about the moment Rhimes realized she'd amassed a certain amount of power in television, and about how she became interested in TV after bingeing on six seasons of Buffy when her oldest daughter was a baby and, she swore, watching 24 episodes of 24 in 24 hours. (I asked her about her favorite episode of Buffy, and she named two classics: "The Body" and "Hush.") We talked about how Grey's came about and how she writes the end of every season as "a massacre," figuratively and sometimes literally, because it's a show she has to blow up and start over every fall, or it gets stale. We talked about the term "guilty pleasure," which she reserves for reality shows, and about her first pitch to a network, and about how hard it was to go from writing movie scripts in solitude to running a writers' room. She talked about being the "dragon" who can protect Nowalk's creative vision for the new show, an image of fire-breathing that's a pure manifestation of her massive and earned clout. At the very end, I read her an audience question that said something like, "How do you think your shows have changed the position of African-Americans on television?" After a little pause, she said one of the things she'd learned was that on shows with Only One (only one woman, only one black character, only one Asian person, only one gay character), that's when the Only One is required to be about nothing except that characteristic. She said her hope was in part that just by having more than Only One on her shows, she gave those characters room to develop and to have other things about them be important. She hopes that — and here's the rub — by consciously increasing diversity overall she makes the race of each character less limiting, less defining. It's very much the same issue we were dealing with in the interview in the first place, right? And in fact, the issue about writing about it? Shonda Rhimes, really, is the Only One. She's certainly the Only One at that level. That's why this keeps coming up for her. That's why, with all her power and influence, this is the piece she got in the Times. It's by having more women and more people of color running shows that you stop having to talk about it all the time, and nobody wants to talk about it all the time. But if you don't talk about it, nothing changes, and that's the trap. You discuss it and spend all your time on it and let it become the only thing about you and let other people set the agenda every time they characterize you: You lose. But you don't respond, don't say what you think, don't share what you know, don't fire back when you're minimized or put down or mischaracterized: You lose. In a way, Stanley did me a favor. Before that piece came out, I was teetering on the edge of maybe not really talking about any of this with Shonda Rhimes at all; maybe we could just talk about Scandal and why they once located a luxury car dealership in Takoma Park (as if! I mean, hybrids, maybe), and she could tell stories, and I could tell her about the way my parents' dog was scared of the beeping hospital machines on Grey's and hid under the table when it was on. Once it was circulating, the challenge of being the Only One was both a conversation I had to have with her and a conversation I got to have with her. But really, you should ask her about the Spelling Bee on a day when the New York Times hasn't called her an "angry black woman." She has a lot to say.